When we lived in Leaf Rapids (1973-79), our phone number was 2978. 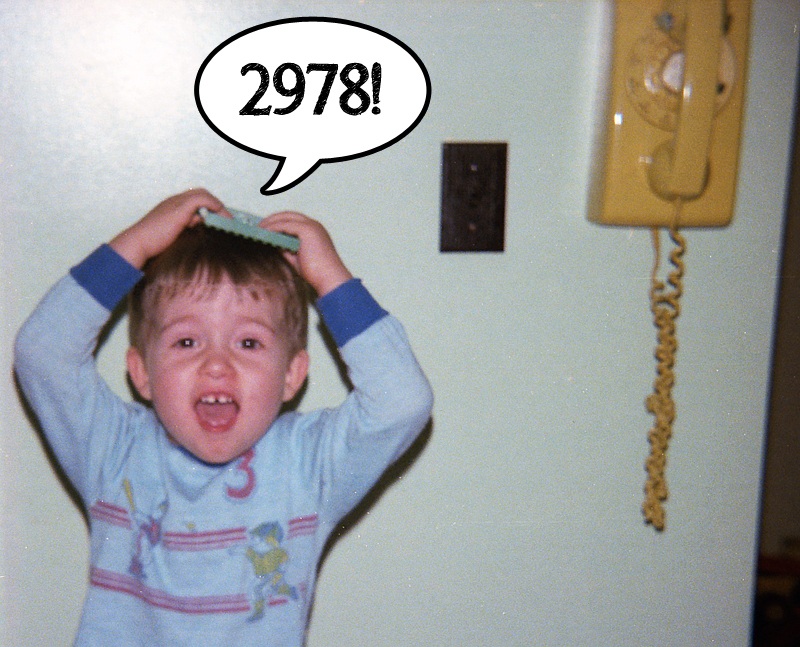 No area code, no three-digit prefix - just 2978. To connect with any of the Woods clan, all one had to do is dial those four numbers and the lovely 1970s Drab Yellow wall phone (pictured here next to Sean, who for some reason is balancing a piece of Lego on his head) would ring until someone answered - or until you gave up, for in those days we had no answering machine. One of my friends had the number 2987. This always blew my mind, but in a town that small and with everyone using only four digits, the odds of close numbers were actually pretty good. Fort Saskatchewan, being a much larger metropolis, used 5 at that time: last digit of the prefix (543 at the time) plus the 4 digits of our number: 4331. That was a lot of 3s, much like my home number now, and quite a boon in the time of literally "dialing" a phone number, as opposed to punching it into a keypad. When they changed the prefix to 998, they added 50% to the dialing time of our number. And Edmonton used to be a long distance call. Then, after that, it was local from Edmonton to/from the Fort, St Albert, Stony Plain, Leduc etc. but it was long distance between those outlying areas. Extended Flat Rate Calling they called it. My second oldest nephew was completely flummoxed by his first encounter with a dial phone at his grandma's house, he literally didn't know how to operate it. I still have one of my Dad's old dial phones, just on principle. Classic black desk phone. My name is Totty, and I have a rambling problem. That's OK. So do I (though I consider it more of a feature than a problem). I just rambled on G+ instead. If you want to impress your more easily impressed friends (who's kidding who - that's all of them), you can still dial by tapping out the numbers on the hook. Good luck with Fort Sask, though. All those high numbers are tiring.